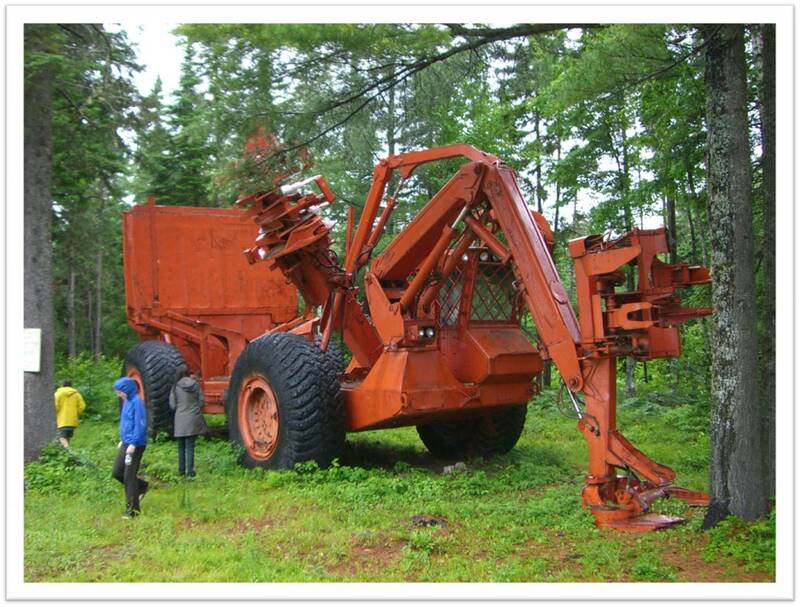 Environmental historians inspect a decommissioned, all-in-one mechanical harvester at the Central New Brunswick Woodsmen's Museum in Boiestown. Editor’s note: This is the second in a series of posts considering the intersection between environmental history and labour and working-class histories. The entire series is available here. We scholars can sometimes be our own worst enemies. Take, for example, how we often establish rigid theoretical distinctions between academic disciplines, fields, and subfields, thereby possibly limiting opportunities for interdisciplinary scholarship. Don’t get me wrong: I’m not suggesting that we should abandon theoretical distinctions entirely. But a lot can be gained from focusing a bit less on areas of divergence, and more on areas of intersection. In my opinion, environmental history is particularly well suited for this sort of approach to scholarship. One of the common concerns that environmental historians voice about their field is that it is too theoretically imprecise, that it needs clearer theoretical distinctions. I tend to disagree. Of course, environmental historians need some sort of shared understanding of what it is that we do. But I prefer to err on the side of more general definitions, something to the effect of “the study of past interactions between humans and nature.” The beauty of such a general definition is that it leaves lots of room under environmental history’s theoretical tent for the inclusion of other fields and disciplines. The international union logo of the United Brotherhood of Carpenters and Joiners of America. UBCJA Local 3012 conceived of the Crown forests as a public resource, one that should be used for the benefit of New Brunswick workers, and not solely for the interests of large, international pulp and paper companies. Woods workers had laboured in the province’s forests for generations. The forests, according to the union, could almost be considered their hearth, their second home. Workers had cut the trees and yarded the logs, not the pulp and paper companies. The companies had no right to dictate who could visit the woods camps, especially those located on Crown lands. Union officials considered their efforts to unionize woods workers and negotiate better wages and working conditions to be an extension of the notion of the Crown forests as public resource, there to generate economic returns for New Brunswick workers. Environmental historians inspect a decommissioned, all-in-one mechanical harvester at the Central New Brunswick Woodsmen’s Museum in Boiestown. The point of these two anecdotes is to demonstrate that, despite initial appearances, environmental history and labour history often intersect more than you might realize. Indeed, for a more comprehensive interpretation of these past events, you have to avoid separating the workers from the forests. New Brunswick woods workers viewed the Crown forests as a public resource that, first and foremost, should be used for providing local employment and facilitating local economic development. Inextricably linked with the workers’ vision of development were notions of class, a commitment to community, and a sense of pride in their craft. Furthermore, the wood workers’ conception of their craft and their identities as workers was greatly influenced by the forests that surrounded them on a daily basis. Forest environments were like their second home. This interaction between workers and forests, and forests and workers, can be best understood through a combination of the practices of environmental history and labour history. Overall, many areas of divergence will remain, but undoubtedly our scholarship as environmental historians can only benefit by seeking out areas of intersection with other disciplines and fields. Miriam Wright, A Fishery for Modern Times: The State and the Industrialization of the Newfoundland Fishery, 1934-1968 (Don Mills, ON: Oxford University Press, 2001), 3 and Tina Loo, “People in the Way: Modernity, Environment, and Society on the Arrow Lakes,” BC Studies, no. 142/143 (Summer/Autumn 2004): 196. L’Évangeline (Moncton), 14 September 1955. The Daily Gleaner (Fredericton), 7 and 8 July 1978, Telegraph-Journal (Saint John), 7 and 8 July 1978, and The Globe and Mail (Toronto), 7 July 1978. If a sealer talks about conservation, does anybody hear?